The Salomon Effect is the board that sits between the Salomon Mans Board and the Salomon Sight. It’s Salomon’s affordable semi-aggressive all mountain ride. It’s for those that like to ride aggressive but not have the most aggressive board out there. There is a more traditional shape than the Man’s board but the camber profile is the same. Set Up- Centered 15 front -15 back around 23″ wide. A lot of people want the most aggressive board out there like the Mans Board, get it and then realize they would have had a lot more fun with a little more mellow ride like the Salomon Effect day in and day out. It lives on the side of the mostly camber hybrid camber but has more rocker in it than some. On Snow Feel: The Effect has a stable camber like feel and it’s a bit catchy but it’s not as catchy as the Mans board. Powder: You can tell that the little setback of -10 mm and the hybrid camber helps a bit but it’s not a super easy powder board. It’s less work than Camber but when it gets deeper it will require some work on your back leg. Turn Initiation and Carving- The Effect also has a more regular footed waist. For example the 159 Man’s board is a 25.6cm waist where the 159 Effect is a 25.0 cm waist. This gives it an easier to turn personality for regular footed riders. 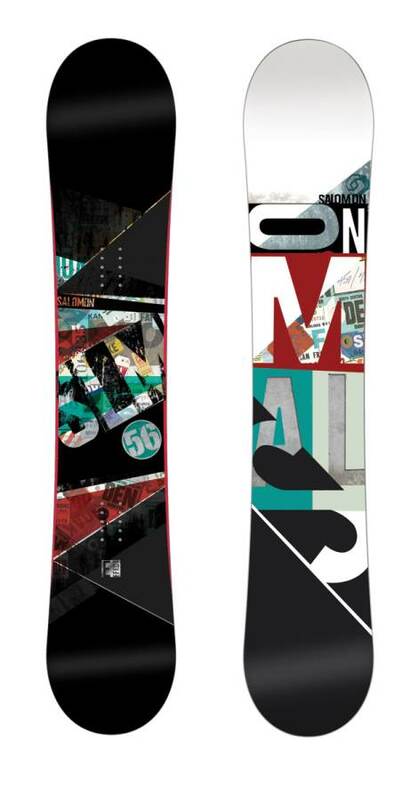 If you are a size 9 the Man’s board 156 with a 25.2cm waist is more the call but with the Effect a 159 is almost perfect. 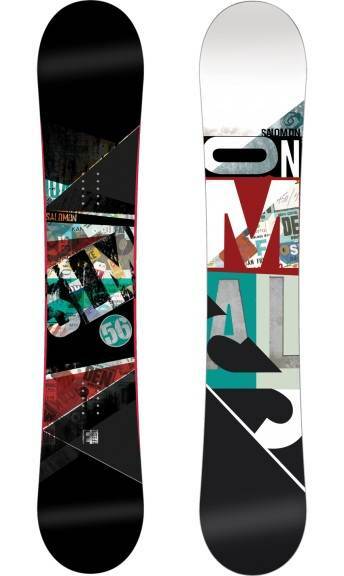 This has easier edge to edge transitioning and it’s pretty lively for a low priced board like this. Carving is very fun and so are wide radius turns. Short radius turns are surprisingly easy for a ride of this style. Speed: Fast and fun for this price range. Pretty damp and doesn’t have the level of reverse chatter like the Man’s board does when things slow down. Uneven Terrain: As the day gets chewed up and the groomers turn into the emerging stages of moguls, the Effect doesn’t have a rough ride like the Salomon Mans Board. Edge Hold: This holds an edge very well. It’s a combo of a creative site, semi-stiff board and camber touching down closer to the bindings. It’s pretty stable. Flex: A nice medium flex that isn’t terrible for a butter but the torsional flex is a little more on the aggressive side. Switch: It’s not perfect but a centered stance is easier to achieve with the minor -10mm set back stance. It feels pretty good switch and rides well. Jibbing- Not the best rail jib board but a little better than the Man’s board. Pipe: Very fun for those that are working on the pipe and those that understand it pretty well. You can carve from wall to wall well and the more medium flex is more forgiving than most camber rides. If you are a pipe novice be careful as you can catch an edge here easier than most hybrid shapes. Jumps: Good Pop for ollies and very easy to get a nice stable take off. All in all, this is a great board for the price. If you want more groomer performance this is for sure the call, but if you want an easier ride in powder, the Taipan might be a better call. We try to get as many images of the Salomon Effect, but forgive us if they're not all there.